For more than twenty years now, Enterprise Integration has been providing world-class network and security support services to both large and small organizations across the entire spectrum of the internet technology industry. Each and every day we continue on with our mission of transforming a very costly, painful and reactive IT support industry. In its place, we offer our customers an expert and much needed proactive approach, as well as customized technical solutions that slash overhead costs, and deliver maximum ROI. EI’s specially chosen team of expert researchers and developers remain at the forefront of discovery, fully engaged in developing next-generation technological solutions designed so that you cannot only compete successfully in a crowded marketplace, but also smoothly ride out the ever-changing waves of evolution. Along the way our expertise and base of knowledge has continued to expand exponentially. Today, EI is an industry leader in the development and application of artificial intelligence, delivered to our customers in the form of our fully automated DRE, or Digital Robotic Engine. With the future of internet technology clearly front and center, EI’s technical advisers are also expert consultants, and in-demand applicators of Net Brain Technologies, Riverbed Technology, the PRTG Network, as well as fully certified CISCO specialists, in addition to other high-tech disciplines. You will discover the uniqueness of DRE is in its innate ability to merge seamlessly with every single piece of hardware within a client’s environment, while reading and deciphering existing software applications already functioning inside a network environment. It then integrates the processes within each application into the DRE knowledge base for further use, in the event at some point in the future remedial action needs to be deployed via one of its multiple functionality features. In practical terms, and based upon the parameters as dictated by the end user, DRE is able to automatically manipulate collected data, which then triggers the desired response. Examples include the creation of a ticket, or the identification of a potential network disruption that needs to be patched. This information will then be automatically delivered to a network administrator or help desk, all without human intervention. In fact, DRE has the ability to identify a problem and solve the identified issue without a business ever knowing the problem existed in the first place. Another winning feature customers enjoy is that DRE is also scalable, so as demand on the system increases, so too does DRE’s capacity to accommodate it. Service Delivery Intelligence, or SDI, is the intelligence that DRE is based on. DRE’s intelligence is data driven, which is critical for the end user. Because it is the collection and dissemination of data that provides our customers with critical insights. This, in turn, allows them to undertake preventive measures that preserves and bolsters their organization’s bottom line. From a competitive standpoint, our DRE also stands head and shoulders above others. Other artificial intelligence programs have no knowledge base of an end user’s environment. When initially deployed, they are blind with no knowledge of the environment they are occupying. Subsequently, users have to program the software from the get-go. The effectiveness of the program is dependent solely on the skill of a programmer. That is a huge differentiator between most of the self-monitoring solutions and D.R.E. The vast majority of monitoring software is only as good as the programmer who manages it, but not so with DRE. DRE closes the door on human error, and reduces the demand on your organization’s resources by deploying a fully automated, industry leading Digital Robotics Engine on your behalf. Our digital robotics engine doesn’t require the re-engineering of your old processes. It has the ability to access data from multiple, disparate sources such as legacy, ERP and external systems. DRE allows you as a company to adjust your processes as requirements change, or new ones emerge. DRE solves and dispatches challenges in an exceptionally faster manner than traditional solutions are able to deliver, due to a no-coding approach. This means your upgrades and refinements to your network can be completed in days and weeks instead of months! 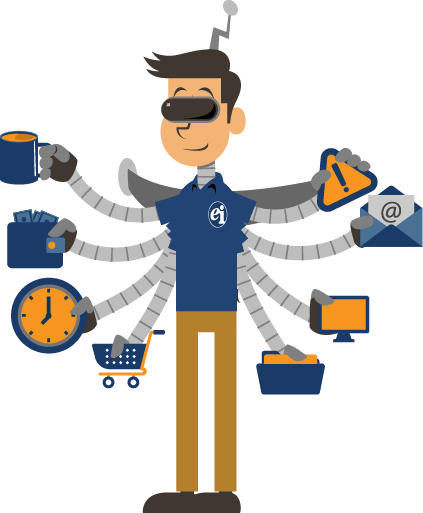 Although cost reduction is a major benefit of EI’s digital robotic engine, the workforce in your company can also gain more time to focus on customer-related issues that require human interaction instead of mundane, repetitive work that uses up a big chunk of productive time in their day. EI’s DRE technology also does away with human error and completes processes consistently and accurately every time. This gives you more accurate and reliable outcomes through the entire process, including superior customer experience. Since our digital robotic engine runs 24/7 and never takes breaks, another major benefit to an organization that implements our DRE is, once your system is up and running, our solution maximizes time and efficiency by eliminating the need for human intervention. The entire Enterprise Integration team couldn’t agree more. All of us here will continue to develop and provide our customers with support that includes best-in-class tools, along with a suite of next-generation technology solutions that reduces overhead, gives you a competitive edge, and maximizes your ROI. That’s our mission, it’s our vision, and that is our commitment to the organizations we serve now and in the future.